East hotel in the heart of Canberra features a homely foyer with a retro feel. You know someone’s given East Hotel thought as soon as you enter the homely lobby: a bank of clean white Apple Macs are at the ready, magazine racks invite browsing, jars of old-style lollies wait to be raided by mini guests – and businessmen reconnecting with their childhood – and the whole scene is watched over by a huge black and white photographic artwork of two cheeky little chaps (owner Dan’s sons). Families with young kids should ask for the Kids’ Cubby, which is kitted out with bunk beds, Xbox console, art supplies and building blocks, and a personal stash of M&Ms and Mars Bars in the fridge. And the grown ups can sit back on the retro armchair and footstool and enjoy the generous living room, fully stocked kitchen, a petite balcony and luxe bathroom complete with Appelles products, all rendered in shades of deep grey and inky black. 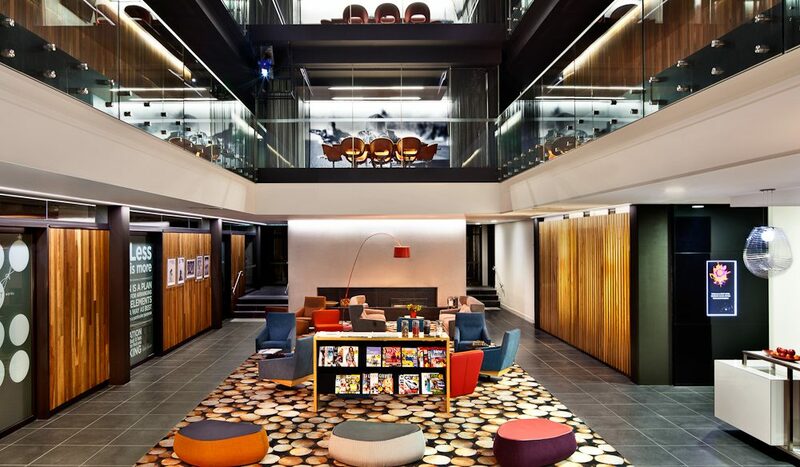 Part of a larger development that also includes three restaurants, a sweet wholefoods café called Maple + Clove (which offers a runners’ group and seasonal yoga classes), a health club, offices, a hair salon, Hotel Realm is the sister hotel to the more corporate Burbury Hotel. The first of this ‘community’ hotel style to land in Canberra, it won the Australian Hotel Awards’ Best Deluxe Hotel in 2012. 18 National Circuit, Barton; 02 6163 1800. A smaller hotel, which occupies just three storeys of the frankly gorgeous Nishi building. For the complete lowdown on Hotel Hotel see our review. 25 Edinburgh Avenue, NewActon; 02 6287 6287. QT Canberra’s official launch date was only 3 April. Set in NewActon, they’re promise ‘secret rooms, private hideaways and secluded spaces’ in a theatrical, design-heavy space with a 200-seat restaurant. We loved the East Hotel when we stayed there mid December 2012. The room was beautifully appointed and thank goodness for the coffee machine. The bathroom was interesting with glass doors which didn’t go to the ceiling for the shower and toilet. Excellent location, as across the main road there are many cafes and restaurants and a supermarket.